Need a little color in your entryway? Trying to figure out how to separate areas of your great room? Want something comfy underfoot at the bedside? There's one answer to all of these questions: area rugs. Area rugs are too often overlooked as a floor option. However, they are some of the most versatile and beautiful flooring options available. Indianapolis flooring store Kermans got its start as an area rug store. With a long history and solid knowledge base of this diverse flooring, Kermans is the area rug expert. Let's learn a few ways you can make the most of area rugs in your home. Area rugs work well on top of any existing flooring. They can soften up a tile entryway. Add a touch of cushion to the hardwood in your bedroom. Create a comfortable walkway on the wood floor of your hallway. Yes, area rugs do all of these. But they also tie together a sitting area on top of the carpet in your living room. They even work well layered on top of each other. There's really no limit to the layering options you have with area rugs. Layering lets you mix styles for a truly unique style. Layers let you show off your personal character by bringing just a touch of your favorite color or an exotic hint that reminds you of a treasured vacation. Area rug layers add texture to a room (a hot design trend right now - see our article: 2015 Design Trends for Home Flooring). Area rugs are the perfect way to add depth to your home design. It's true that traditional area rugs come in square or rectangle shapes. Oval or circles are also fairly common. However, area rugs aren't limited to these traditional shapes. Area rugs come in any shape and size and can even be custom made to fit a space. Area rugs are the perfect way to add a cozy touch to a large room. Area rugs also help distinguish an area and create a distinct space. The only limits to an area rug's shape and size are your imagination. Many of us watch home design shows or read magazines and see a design trend we'd love to place in our home. Few of us have the budget to change our interior design to fit each year's trends. Area rugs can be the perfect way to bring a trend home without breaking the bank. The right area rug can change the whole feel of the room even if it's the only new addition. Bold graphic prints, trendy colors, fun patterns - all are available in area rugs. Looking for more area rug inspiration? Check out our Pinterest board. 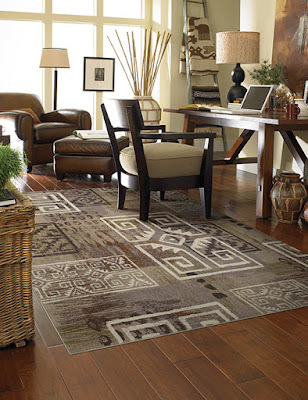 When you’re ready to buy an area rug you need reliable information and quality products. You need the experts at Indianapolis flooring store Kermans. Our design staff is ready to answer your questions and show you a wide variety of area rugs. Learn everything you need to know from our free area rug buyer's guide. Then schedule an appointment with our free in-house design consultants to find the best area rug for your home.